Follow the 4 steps given in the Infographic below to participate! Submit your listing for a chance to win $500 CASH! We will give out a total of 100 prizes to 100 lucky winners!!! 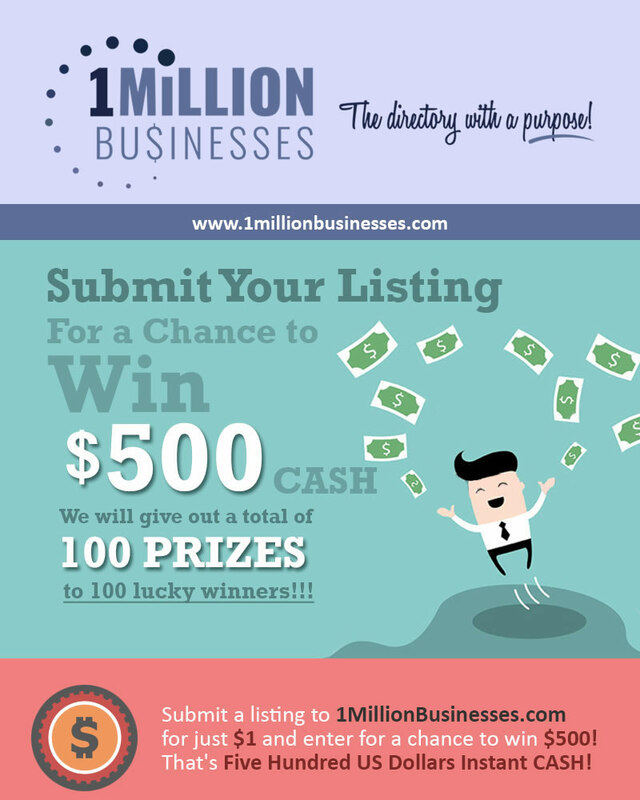 Submit a listing to 1MillionBusinesses.com for just $1 and enter for a chance to win $500! That’s five hundred US Dollars Instant CASH! Follow the 4 steps mentioned below to enter. Failure to follow all the steps will disqualify you as a winner. 1. 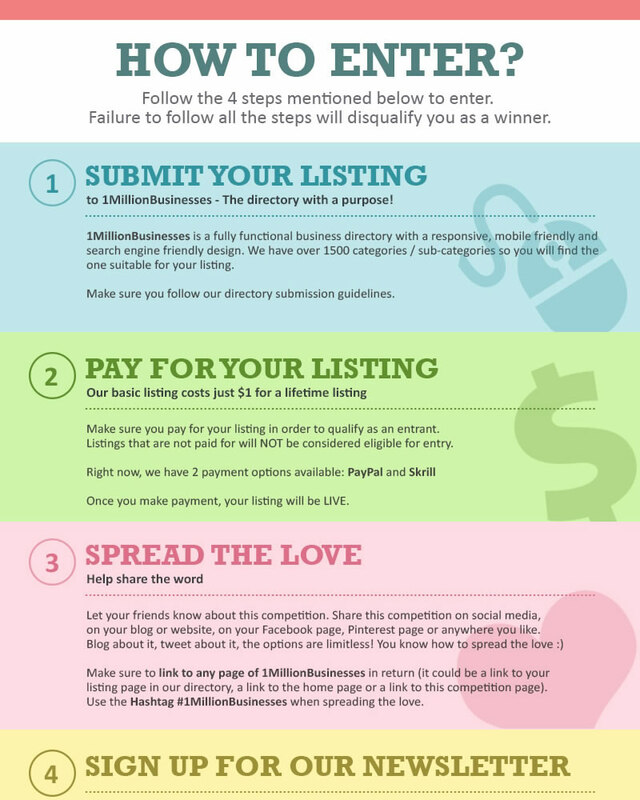 Submit your listing to 1MillionBusinesses – The directory with a purpose! 1MillionBusinesses is a fully functional business directory with a responsive, mobile friendly and search engine friendly design. We have over 1500 categories / sub-categories so you will find the one suitable for your listing. Check out our directory structure to find a suitable catgory for your listing. Follow this tutorial to help you trough the submission process. Make sure you follow our directory submission guidelines. Make sure you pay for your listing in order to qualify as an entrant. Listings that are not paid for will NOT be considered eligible for entry. Once you make payment, your listing will be LIVE. Make sure to link to any page of 1MillionBusinesses (it could be a link to your listing page in our directory, a link to the home page or a link to this competition page) in return and use the Hashtag #1MillionBusinesses when spreading the love. You can even use the banners given on the Link to 1MB page. In the end, fill out the ‘Newsletter Signup‘ form given in the footer of every page. Use a valid email ID so we can contact if you are chosen as the winner. Anyone who has a website, blog, Pinterest page, Facebook page, Twitter page, personal web blog, a local business or even an Etsy page that they want to promote can enter. Simply follow the 4 steps given above to enter. The more listings you submit, the more chances you will have of winning. Payment will be via PayPal / Skrill (formerly Moneybookers) which means the winner will get Instant CASH payment! Winners will be contacted via email so make sure you enter a valid email ID. If you have been announced as a winner, it does not disqualify you from winning again. 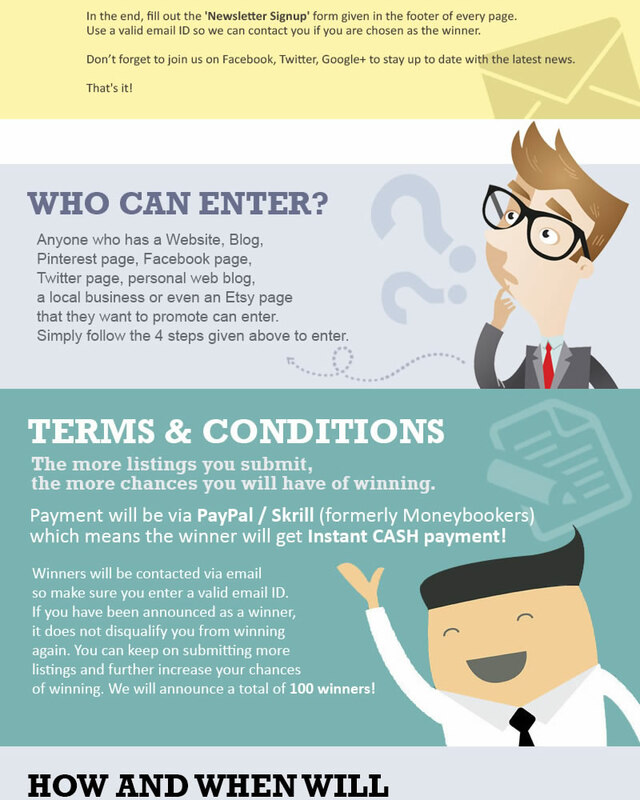 You can keep on submitting more listings and further increase your chances of winning. We will announce a total of 100 winners. How and when will a winner be chosen? 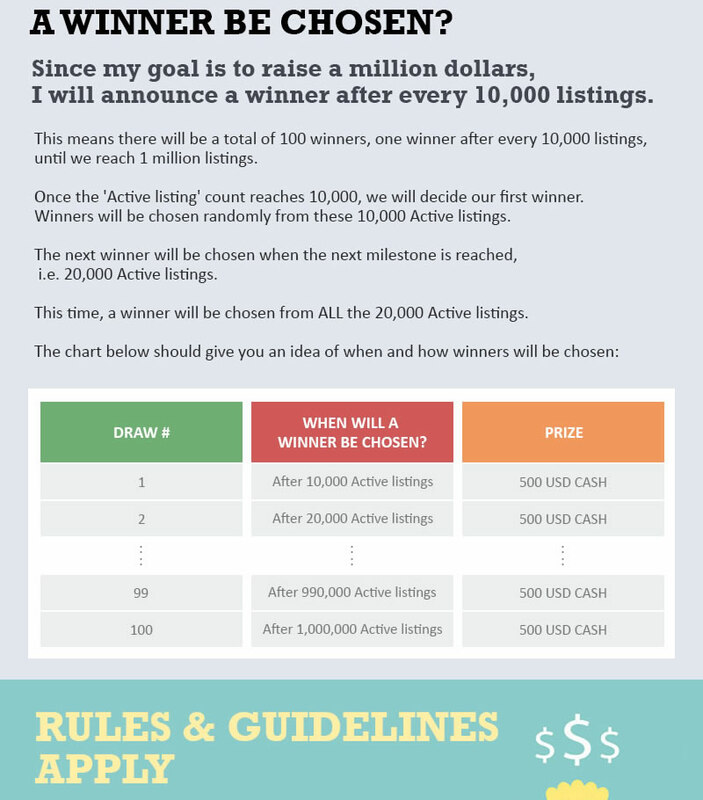 Since my goal is to raise a million dollars, I will announce a winner after every 10,000 listings. This means there will be a total of 100 winners, one winner after every 10,000 listings, until we reach 1 million listings. Once the ‘Active listing‘ count reaches 10,000, we will decide our first winner. Winners will be chosen randomly from these 10,000 Active listings. The next winner will be chosen when the next milestone is reached, i.e. 20,000 Active listings. This time, a winner will be chosen from ALL the 20,000 Active listings. When will a winner be chosen? Winners will be announced on our website, blog, Facebook page and Twitter page etc. The winner will be sent an official email and will have a week to respond and claim the reward. If I do not hear from the winner, I will send 2 reminder emails before I give up. Join us on Facebook, Twitter, Google+ to stay up to date with latest news and don’t forget to sign up for our newsletter.